You are currently browsing the Suburban Homesteading – Frugal Living blog archives for July, 2011. A video tour through our suburban Homestead. This past week has been a whirlwind of post fair chaos, preparing for our county fair and heading down the road to a first college semester. Needless to say it has a bit overwhelming for two women who value the calm and slowness of their farm life. But, tonight is different. The laundry is washed and folded and put away. The trailer has been unpacked, restocked and packed up again, waiting patiently for the day it will leave on its next trip. The animals have settled back into their “home” routine. The night is slow. A westerly breeze rolls through the house, sweet and cool, from a distant coast. After a week eating out of an ice chest or eating at restaurants, putting a crimp in our desire to eat more locally, we are more than ready for a home cooked meal. One that was raised or grown either feet from our back door or a few miles from the farm. Tonight’s menu: lamb chops from a lamb we raised last year, potato salad, made from white new potatoes and accented with celery, onions and pickles; and corn on the cob I picked up from the local farm stand. Want to Make More than a Banker? Become a Farmer! This was the lead in title to a series of financial articles I received recently about our current economic woes, big business crashes and the coming crisis for small town America. NOW – I don’t claim to be a whiz in the financial world. I, like most of you, has struggled and lived through the last few years and am skeptical about almost everything coming out of D.C., the financial community and the main stream media. But, one thing struck me. It was the number of articles regarding agricultural commodities and the increases in the Ag industry. My son recently graduated from college. He and his friends are now looking for jobs. Anyone who saw Friday’s employment report knows that the job market is tight in the U.S. The outlook is even bleaker for recent college grads. Today, there are more biology and business majors tending bars and restocking shelves at Target than ever before. In the ‘60s and ‘70s, college graduates went onto medical or law school to become doctors and lawyers. Suburban homesteads come in many shapes and sizes, taking their own path to self-sufficiency, but, in my mind, a true homestead needs livestock to be complete. Whether two footed or four; feathered or furred or wooled, animals are what turn a backyard garden into a full fledged farm. Without them all you have is a garden, which is nice, but a homestead is a little more scrappy. It’s loud and it’s dusty and sometimes messy when it’s full of feathers and cloven hooves, paws and fur. 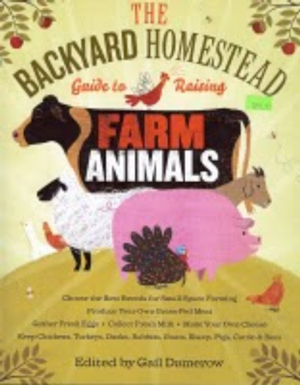 I found a new book for my homestead library recently – The Backyard Homestead’s Guide to Raising Farm Animals. It’s the livestock companion to the original Backyard Homestead, and it’s a fine introduction to jumping on the livestock bandwagon. At first it may seem a little elementary for the more seasoned livestock person, but it’s perfect for those who have dreams of turning their landscaped suburban lot into a thriving mini-farm, or those who have never held a chick or readied a hutch for kits. It’s a friendly read, full of easy to understand information about the basics of starting a flock of chickens, ducks, turkey’s or geese; a hutch or two of rabbits; or a herd of goats, sheep or pigs. It even has information about raising cattle on a small suburban homestead. It will give you a good idea of what you’re getting yourself into, along with wonderful plot maps on how to lay out your farm if you’re just getting started. The illustrations and sidebar instructions are great and each species is broken into its own chapter, so you can read only those parts that interest you. Want goats, but not pigs. Fine. Can’t have bees, but can have chickens. No problem, just read the chapters you want. Even with my years of livestock experience I’m still able to glean useful information from new sources. It’s becoming a new favorite around here. Grab one for yourself. 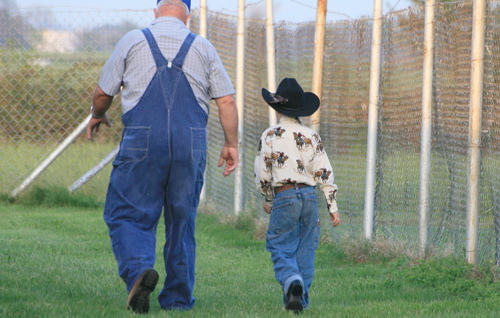 A farm is an ever flowing river of new life coming in and saying good-bye to a life lived long and happy. We were reminded of that this past week when our beloved Springer spaniel “Dakota” died. We were at the State Fair when we got the news. Actually, Brianne was in the middle of the show ring when I heard, so I opted not to tell her until the next day. Knowing wouldn’t have changed anything, but it could have greatly affected her showing ability. He died of natural causes. There was no lingering disease or injury that took him from us, just a long life lived out that was ready to come to a close. Over the past few months Dakota had begun to slow down, sleeping more and playing less. He still ate well and would occasionally roll around in the grass especially if there was someone to watch and play with him. He still followed us out to the barn and monitored the activities of the chickens and the sheep, albeit at a much slower pace than in his youth. But, his gait was that of an old man, his bark less robust. The signs were there. I knew his time was coming. He passed away on a cool summer morning, in the shade of a potato vine that grows along our south fence. It was his favorite spot. Not a bad way to leave this world, I think. We rescued Dakota from the pound almost 9 years ago. At his adoption, the kennel manager thought he could be 3 to 5 years old. They weren’t sure. He was a loveable, cuddle dog who loved to be with his people. 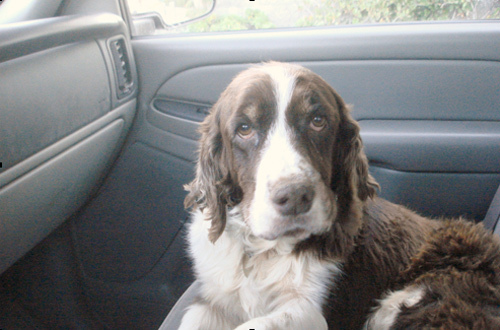 He was our truck dog co-pilot and backseat driver. He loved to go everywhere in the truck. He was the watcher of our sheep and gentle around the poultry. He lived the life of a farm dog…rolling in mud, eating poop, chasing squirrels, guarding our farm, eating fresh from the garden and lying in front of a warm fire in winter. We made a lot of great memories with that dog. He will be missed. Within 5 miles of our house we have three U-pick operations and several Farmer’s Markets where we can find a good selection of seasonal berries. And, although there is nothing better than jumping in the car, combing fields for the freshest produce and ripping it from the soil, the place I like the best is my neighbor’s backyard. We watch Fran and Joe’s place, feed the chickens and water the gardens when they are on vacation. Our payment…anything that’s ripe. It was cloudy and a slight westerly breeze blew when Brianne and I walked down the street to check on things. As Brianne went about her chores, I headed for the berry patch. 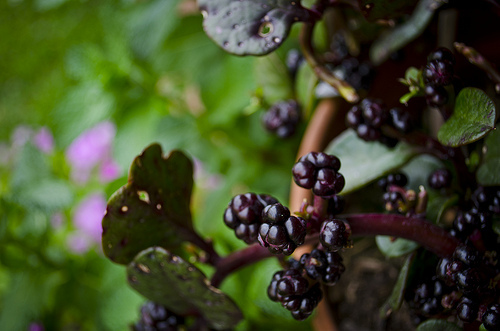 The huge, dark blackberries clung to their canes like gems. I filled my colander. I had a plan. That afternoon I would take these little gems and cook them slowly on the stove, filling the house with their sweet aroma. Mmmm. Making any kind of Berry Jam is easy. All you really need is berries and sugar. You can use pectin (liquid or powder) if you like, but I prefer not to. I just fill a large pot with 9 cups of berries and 6 cups of sugar, turn the heat on and slowly bring to a boil, stirring occasionally, until all the sugar is dissolved. At this point I either mash the berries with a potato masher or lightly whirl them with an emersion blender, making sure to leave a bit of chunkiness. I continue cooking and stirring the jam rapidly until it reaches the gelling point. When the jam is gelled enough I remove it from the stove and ladle it into hot jars. The jars are dropped into the water bath canner for 15 minutes then set on a clean dry cloth to cool. When you hear the tell-tale POP of the lid, signaling the proper seal, you know you’ve done it right. The whole process, from first wash of berries to the last lid POPPING takes less than an hour. And, for that you get enough berry goodness to remind you of summer all winter long. I made 9 pints of jam. That’s a lot of jam, folks! And, what a bargain, too. For the price of a few jars and lids, and free berries from friendly neighbors my pantry is stocked with something way better than Smuckers. Not a bad deal! For detailed instructions, pick up a copy of the famous Ball Blue Book Guide to Preserving, at any hardware, farm store, book or discount store. It covers everything you need to know about canning and costs less than a case of jars. Enjoy! The past few months have been a crazy ride of unpredictable weather, sheep shows that seem to never end, baby chicks brooding, new geese, and a high school senior year fraught with fear and excitement about the future. But tonight it’s the middle of June, Brianne and I have managed to make it through all this chaos without killing each other and we two girls deserve a night out! So tonight we will go out to our favorite café, sit at our favorite table – French bistro draped in a mustard colored cloth and laid with rustic plates featuring hand painted chickens. The best part is this favorite spot of ours is under a lumbering shade tree just 50 feet from our back door. Most nights we don’t feel like driving anywhere or paying someone to cook a calorie laden mediocre meal. Tonight’s menu: marinated grilled lamb chops, BBQ baked potatoes and a big salad of crisp greens. The lamb was home raised and butchered last fall (the last of the lambs Brianne showed in the spring), potatoes are from the farm stand down the road and were dug fresh today, and the salad makings were picked moments before the whole feast was laid on the table. 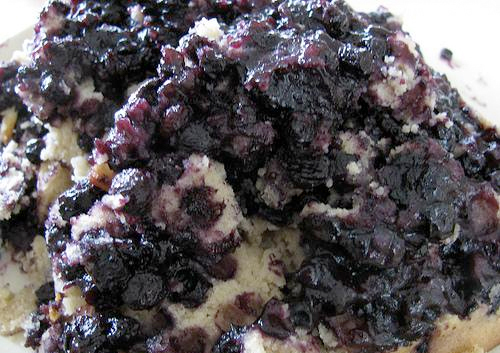 For dessert there’ll be blueberry cobbler with organic vanilla ice cream. The final course: stargazing to the sound of harps and classical guitars drifting out from our quiet little farmhouse. My favorite tunes to relax to on a lazy summer night. To make sauce, mix together all ingredients, except lamb, and pour into a lidded storage container. Give a few vigorous shakes before adding lamb. Turn several times to coat lamb thoroughly. Marinade in the fridge all day. Remove about 30 minutes before cooking. When grill is ready, remove lamb from sauce, cook until about medium, but still pink in the middle. 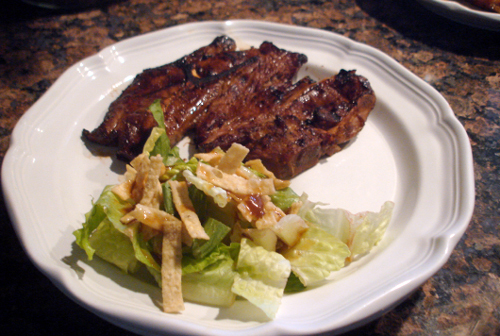 This is an Asian style marinade and goes well with Asian slaw or a salad with Asian dressing.